With hope and transformation in the air as Somalia experiences its first sustained period of peace for two decades, a group of veteran Somalian artists have taken up their brushes again to send out a message for a better future that can be seen large and clear all around the city. By Abdi Latif Dahir in Mogadishu. On the eve of the new year 2013, a freshly painted billboard went up on the busy KM4 intersection in Somalia's capital, Mogadishu. The timing of its unveiling was symbolic: it hailed 2013 as the year of changed fortunes and the start of an enduring period of stable nationhood in Somalia. The painting took artist Muhaydin Sharif Ibrahim, a thin, stooped figure gnarled with age, almost four days to sketch, draw and paint. On the last morning of 2012, and as the deadline approached, Muhaydin carefully applied the finishing touches: scuffing the paint, applying shades of blue on white lines and high- lighting certain words in bold. "For me, it is not done until they take it out of this place and put it up on the street," he said, his hesitant smile easing onto his face. Muhaydin was relishing the moment, and the paint, brush and canvas all seemed to collaborate to create his story of how Somalia has come of age. For almost two years now, as the war ebbs in Mogadishu, the Somali capital has been experiencing a sense of transformation and renewal that promises new opportunities. A new government led by President Hassan Sheikh Mohamud was elected in September 2012; construction is booming; commerce is thriving; and solar lights have been switched on in the city's main thoroughfares, causing welcome traffic jams deep into the night as people enjoy staying out late. Amidst all this, a group of wizened and weather-beaten men have been making a quiet comeback. They have banded together to make their mark on history and to paint into memory the final act of a civil war that has lasted for more than 20 years. They are the painters of Mogadishu, who, with all their talent and great artistic skill, were reduced to nothing but a footnote in history by the country's brutal fortunes. At the height of Somalia's civil war, many artists stopped painting. Those that continued often lost their valuable works as they fled the country. The situation got even worse under the yoke of Al-Shabaab, as the Islamist militia outlawed music and drawings, considering them a sin. In a converted garage far away from the din of downtown traffic, a group of artists sets to work. Paint-stained hands moved deftly across sketch boards and canvases as each of the artists concentrated on his work. Some, like Jeilani Ibrahim, like to sit up on a stool and use a blunt pencil. Others, like Muhaydin, prefer to take on the huge billboards with an armada of brushes. Both get the job done in their own way. Trained in Italy, Jeilani reminisces about a glorious past of gallery appearances and appreciation. "Art held a central place in Somalia," Jeilani says. "When you are going through the town today you will see rundown shops, but they have bright paintings outside showing what they have in stock. Sometimes they will paint every single thing in that shop," he quipped, his eye widening from behind thick spectacles. Muhaydin, listening to the conversation, adds that "the love for art was almost natural amongst Somalis. People had so much respect for the work the artists did back then." Muhaydin could easily have been referring to the poetry and theatrical performances that shaped Somalia's artistic culture for hundreds of years. Somalis, have a high regard for art in all its forms: including music, theatre, painting, poetry and literature. Today, Somalis are winning prizes through their love of words: Kenyan-born Somali poet Warsan Shire won the inaugural Brunel University African Poetry Prize from the British university in late April, while Maxamed Ibraahim Warsame 'Hadraawi' was presented with the Prince Claus Award for his poetry in Hargeisa, also in April. Somalis were creating art as long as 7,000 years ago — though this was not known outside Somalia until 2002 when the discovery of the Laas Gaal cave paintings in the northern region of Somaliland caused a sensation. The prehistoric paintings depict neolithic inhabitants raising their hands in praise of cows and camels which are glorified in ceremonial robes. The colourful shop-front paintings mentioned by Jeilani mostly started after the war broke out in 1991, when artists found it difficult to sell their paintings so offered their skills to local businesses. With many Somalis unable to read, their iconic images did the job of advertising what goods or services could be found inside, from soft drinks to (sometimes only too graphically expressed) dental or medical services. Adan Farah Affey is one artist who is always excited to talk about the history of art in Somalia and the critical role of artists in society. Balancing a cigarette and a tube of paint in one hand, Adan says he never runs out of inspiration. With an effusive welcome, he laid out his collection of artwork for the visitors. Inspired by Somalia's milestones, its larger-than-life personalities and frequent breaking news, Adan has amassed an incredible body of work, to the point of chronicling almost every significant event and debate in the country as well as the figures that have shaped Somalia's past. "There was no other way of getting it out of my mind," Adan says. "This was the only way for me to preserve history and keep it for the future generations." He painted a portrait of anti-colonial leader Mohammed Abdullah Hassan, known as the 'Mad Mullah'; there is one of warlord Mohamed Farrah Aidid, a key target in the United States-led Operation Restore Hope in the early 1990s; a painting with swirls of colour depicting the dangers of hate media; and he has painted an adaptation of Joe Rosenthal's photo Raising the Flag on Iwo Jima — only this time the flag is the sky-blue and white-starred Somali flag. "Whenever I get an idea, I try to put down what I make of it," Adan explains. Painters like Adan and Jeilani have come out of the shadows thanks in part to the Centre for Research and Dialogue (CRD), a not-for-profit institution that aims to promote art as a tool for peace-building. Its other projects include a musical talent show. Over the past year, the CRD has offered the artists the materials and space to design paintings with messages promoting peace, unity and good governance. 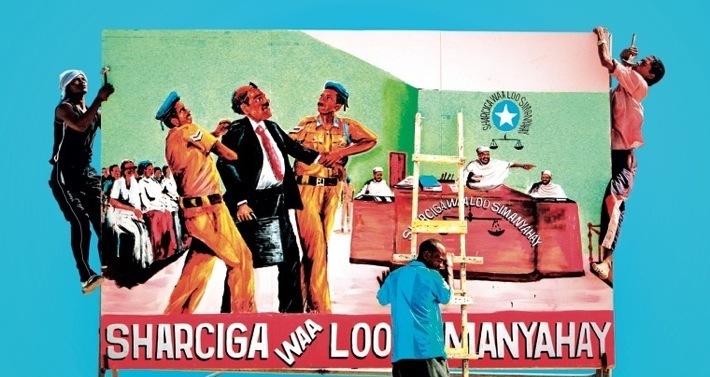 Across the streets and the bullet-rid- den buildings of Mogadishu, billboards painted by the likes of Muhaydin and Adan dot the landscape with messages to respect the rule of law, shun clanism and report corruption and crime. "It is every inch a revelation for us as it is for the rest of the city's residents," says Ahmednur Abdulle, a project coordinator at the CRD, of the artists' output. The billboard paintings, more than two dozen of them in just under a year, have captured the attention of residents and visitors alike. They stop to look at them, studying the brushstrokes and reflecting on the meaning of the words. Mohamed Abdulkadir Yahya, a programme officer at the CRD who works closely with the painters, says the enthusiasm surround- ing the paintings has increased so much that the centre is now looking at how to showcase them in an exhibition. "It would be ideal to put them up in the national museum in Mogadishu or organise an exhibition in Nairobi where many in the Somali community can access them," Mohamed says. In preparation, Mohamed has been keeping aside a number of paintings he has dubbed "the classics". They include abstract paintings that can provoke deep memories and emotions, critically reflecting on how the war has affected Somalia and its people over the years. Khadija Isse, an art enthusiast and a young poet, said that the paintings have "captured the imagination of old and young people alike. People would ask: 'Who painted this?' They would stop and discuss and read into the paint itself." In late January, a few weeks after KM4 intersection received its painting, a new one was erected a few metres outside Mogadishu's international airport. This time, the painting emphasises the equality of all citizens before the law, showing a man in a suit and carrying a briefcase be- ing dragged into court by police officers. "This shows you that a new era has come," Abdinasir Mohamed, a university student, says, while staring at the piece. "But what a painting says and the reality on the ground can be very different at times." Back in the garage-turned-studio, paint cans compete for space on the floor and the air is thick with cigarette smoke. The painters sit intently at their stations, brushes coursing on the canvas. "We hope to leave something solid for the coming generations," explains Adan, adding that there is a need to in- spire a new generation of young artists. Amidst the singing and the good-natured banter, fingers deftly sketch a new future for Somalia.